Carefully crafted complementary treats for smaller dogs. 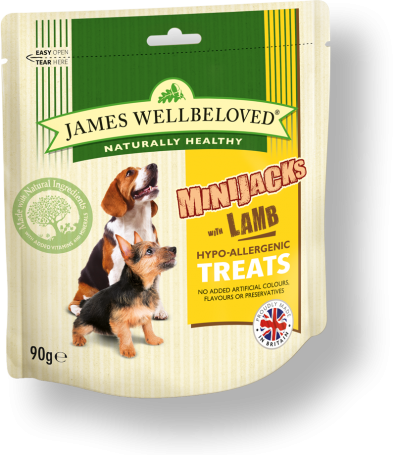 Using all our knowledge and experience, we’ve created James Wellbeloved lamb treats for smaller dogs. We take a handful of ingredients from nature, one source of animal protein and combine them with all the vitamins and minerals your dog needs. And all the great taste it deserves. For added peace of mind, it’s naturally hypoallergenic so less likely to cause an adverse food reaction and you will never see any added artificial colours, flavours or preservatives. Not now, not ever. Feed responsibly as a treat at any time; be aware that treats will add to your dog’s calorie intake. 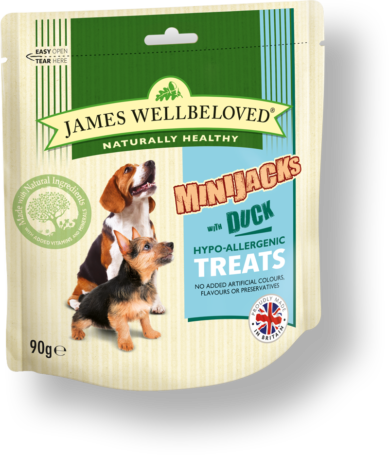 8 Minijacks have approximately the same calories as 10 g of James Wellbeloved dry foods. We recommend that treats should not exceed 10% of the total calorie intake. Always ensure fresh drinking water is available. Analytical Constituents: protein 15.0%, crude fibres 4.0%, fat content 11.5%, crude ash 6%. Very good cat food. Would recommend to anyone. I have used this cat food for many years now. Never had a cat not like it & all cats i have had who have been fed on it have been very healthy all their lives. My fussy cat loves it!!!! My cat, who is rather fussy, did not notice any difference with this food to the normal turkey dried food. I have been advised by the vet to get her to lose a bit of weight so was concernced about changing her food but I needn’t have worried. She tucks in just as happily! My cats loves them. They are quite expensive but there is no waste as my cat eats every last morsel! !